Food allergies are serious and anyone working in the catering industry needs to be aware of their legal responsibilities to protect customers. When exposure to a certain food can mean the difference between life or death kitchens need to be able to answer whether they can or cannot guarantee a customer’s safety. Following legislation introduced in 2014, premises offering food or drink need to be able to identify the main 14 allergens should they occur in their food. And with food allergies rising at a rapid rate restaurants are well served to adapt their menus to cater for those who suffer from allergies such as peanuts, milk, egg, gluten and fish. The responsibility for ensuring diners who have passed on information about their allergy remain safe lies with the caterer. The good news is that awareness of food allergies is growing by the day and restaurants are usually happy to cater to those with specific needs. While most kitchens will ensure an ingredient is not used in a specified dish many are setting up specialist food preparation areas. This means restaurants can also give customers reassurance that they have taken steps to avoid cross contamination. This level of service will in turn promote loyalty. While not all kitchens have the space to introduce separate food preparation areas those that do may want to consider identifying a counter that is kept free of specific allergens, along with chopping boards, utensils and pans. 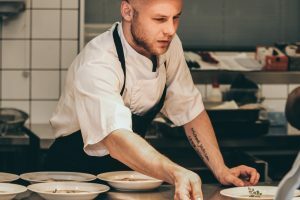 Restaurant kitchens can also choose to use a dedicated fryer for allergen-free foods to avoid the risk of cross contamination, particularly where nuts and gluten are concerned. Even in kitchens that do not have the pace for a dedicated counter, keeping preparation equipment separate is a good idea. Always practice excellent hygiene to minimise the risk of cross contamination by thoroughly washing equipment and frequently washing hands. Encourage staff with signage reminders, ongoing training and adequate facilities. Good customer service – as well as great food – is what keeps diners returning time after time. Staff need to be trained well and customer feedback regularly sort. Taking steps to make your allergen awareness scheme fully comprehensive will not only help to protect your business and customers but will also encourage people to return – and pass on their positive feedback. To discuss adding new equipment to your kitchen get in touch with the Caterline Ltd team today.